A Fresh Breath: Deck the Halls With Boughs Filled with Savings! 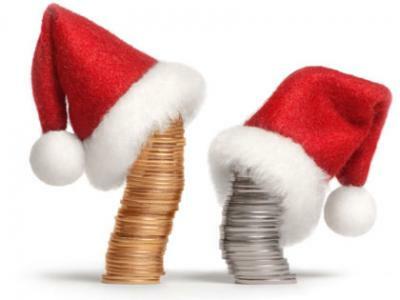 Deck the Halls With Boughs Filled with Savings! I thought I would check in every couple of weeks to let you know how my budget world is going. I have to tell you, as I look to the next month, I'm a little intimidated. For serious. Holiday parties commence, there are presents to be purchased. It's absolutely a joyful season, but if you're on a tight budget, it can be a little scary. Now, people have told me before "Just make your presents" - right. I'm not the crafty type. I always wanted to be - I even stole someone's art project in 2nd grade and claimed it as my own because I hated mine and theirs just looked cooler. It was a tiny clay jar painted black on the outside with purple and red on the inside. I even came up a story behind my "inspiration for the piece." I think it's still on a shelf in my parents' home. Merry Christmas, Mom. So, what can I do to get through the season while staying true to the budget I need to set to meet my goal? Well, I did what any other self respecting person would do and I googled it. It's amazing what happens when you google "Help me find awesome Christmas deals!" Did you know that there's a store selling Thomas the Tank engine trains for just $10? Dad - get ready! I came across a nifty website- retailmenot.com - the have a whole bunch of coupons available for people to use. Pretty great. I'd love to hear what you all do to navigate the holidays on a budget. Please share in the comments below! coworker who had been doing a little research on this.